As more businesses turn to cloud computing and mobile commuting, companies are looking to remote workplace solutions. Widely available wireless internet enables remote office and home-office access to your business resources without needing to go in to the office. Remote users pose unique issues and concerns with the need to access company data while keeping it secure, centralized, backed up and available anywhere, any time. Delivering virtual desktops and applications from the cloud, we provide a turnkey virtual desktop solution to small and medium businesses. What is a virtual desktop or Desktop-as-a-Service (DaaS)? Simply put, it is a mobile computer or a cloud PC that resides in a data center where users can customize the desktop as their own. The user can access the hosted desktop from any device (iPad, Mac, PC or Android device). In the hosted desktop environment, we offer the ability to rent applications by the month; we offer over 40 applications, such as Microsoft Office and more! More than 40 percent of businesses are still running Windows XP, either because they use applications that are not compatible with Windows 7 or 8, or because it is too costly and time consuming to upgrade. 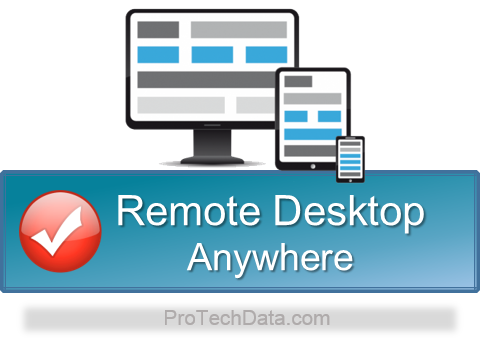 With ProTech Data’s Remote Virtual Desktop Anywhere solution, we take the pain out of the daunting process of upgrading your PC. One of the best things about virtual desktops? They’re not tied to a single device. With a remote virtual desktop from ProTech Data, we’ve taken this a step further – you can access your applications, your data and your entire desktop environment from nearly any computer, smartphone, tablet, or netbook. Made available for both Windows and Apple computers, iOS, iPad, iPod, and Android devices. Protection – Each user accesses their applications from our environment, protecting the company against virus & malware attacks. Complex licensing – Enterprise licensing is extremely complex & expensive. We streamline licensing and make delivering software headache-free. Save Money – We save organizations over 50% compared to an in-house solution or a VDIsolution. We’re pleased to offer two opportunities for you to explore what we can do for you. Try ProTech Data Remote desktop solution yourself and feel the speed!